Bees And Pesticides: What Is Safe? As a general rule, PerfectBee recommends against the use of pesticides or any form of chemicals around your bees wherever possible. However, we also recognize that many of you are avid gardeners or are well within your bees’ range of neighbors who will use pesticides. The following guidance is therefore a pragmatic perspective on the use of pesticides and how it relates to beekeeping. Even “approved” chemicals can be harmful to your bees when used incorrectly. We strongly recommend researching the use of any chemical before using around your bees. Are you a gardener? Do you have a neighbor who gardens? If your answer to either of these questions is ‘yes’ then you need to read this article. Why? Because bees and pollination go hand in hand. They are awesome little friends of any gardener because of the amazing amount of growth they bring. But the relationship between gardener and bee can be a dangerous one for our bee friends. If gardeners don’t have a clear understanding of what pesticides harm bees they may be unknowingly killing them. So if you are a gardener that wants to fight pests in your garden without harming your bee friends, hang around. Today, we have a full list of pesticides that are and are not good for bees. Which Pesticides Should I Never Use? There are some pesticides that should never, ever be used around bees. They are simply not safe and will kill them if they are sprayed in an area where a bee might feed. I want to make a special note about Diatomaceous Earth. I actually use it a lot around my bees. They are great at keeping pests out of bee hives. However, I use it in places where my bees will not feed such as under their hive stands. So you can still use it just make sure that it is in a place where your bees will most likely not go looking for food. Which Pesticides Can I Use In The Right Conditions? These are pesticides that are not safe around bees when wet or while they are undissolved. However, bees are usually still in their hives early in the morning, and they head to bed around dusk. So if you must use these pesticides be sure to use them then. It will give them a chance to dry or dissolve before bees come around the plants to feed. If these pesticides are sprayed at a time that they will have time to dissolve then they should be safe to use. But remember, if they have not and a bee lands on them it will most likely be detrimental to their health. Which Pesticides Are Honey Bee Safe? There are some pesticides out there that can be applied at any time and any place that will not bring harm to your bees. Yes! These are gardeners’ friends because they help protect your little pollinators while also keeping pests off of your beautiful plants. If you have a pest problem in your garden and need to use a pesticide to fight them then try to choose from this list. It has less rules to follow for bee safety and should certainly help your plants that are being attacked. If all of this seems a bit overwhelming there are other options for safely fighting pests and protecting your bees simultaneously. They are neat little covers that look like small greenhouses or plastic that float over your garden rows and allow sunlight to get through while keeping the pests out. This becomes quite a tedious task especially if you have a lot of pests. But it does work well and is totally safe for your bees. I did this one year when we were over run with June bugs. The traps are usually bags with bait in them that hang in your garden. You watch the bags fill up and throw them away when they are full. Bugs usually return to where they feasted previously. So if you rotate your crops it kind of confuses the bugs, and they have to work a little harder to find what they are looking for. The good insects will take care of the bad ones. So you can plant things like marigolds in your garden. They help draw good bugs and deter the bad. By keeping your garden weed free it offers less for bugs to feed on and makes it harder for pests to hide. So keep the weeds out of your garden, and you’ll be surprised at how it might help deter those unwanted pests. We do this now and it works great! We have two guineas that roam all over our garden and property. They eat every bug they come in contact with. My garden has never looked so good. These are just a few options to help keep your plants healthy and safe without the use of pesticides. If I Choose Pesticides What Should I Keep In Mind? Not everyone chooses to go completely organic and that is okay. So if you absolutely know that you want to go with pesticides, there are a few things you can do to insure your bees’ safety while using them. Spray early in the morning or at night after your bees are home and safely in their hives. If you have a plant that is specifically being attacked by pests but it is next to a plant that you know your bees eat from use caution. Try to avoid treating the plant all the way around or at least wait until the plant isn’t blooming. It is important to remember that bees only eat from plants that are in bloom. So if you have a plant that hasn’t bloomed yet, feel free to treat it with whatever pesticide you need to in order to save it from pests. 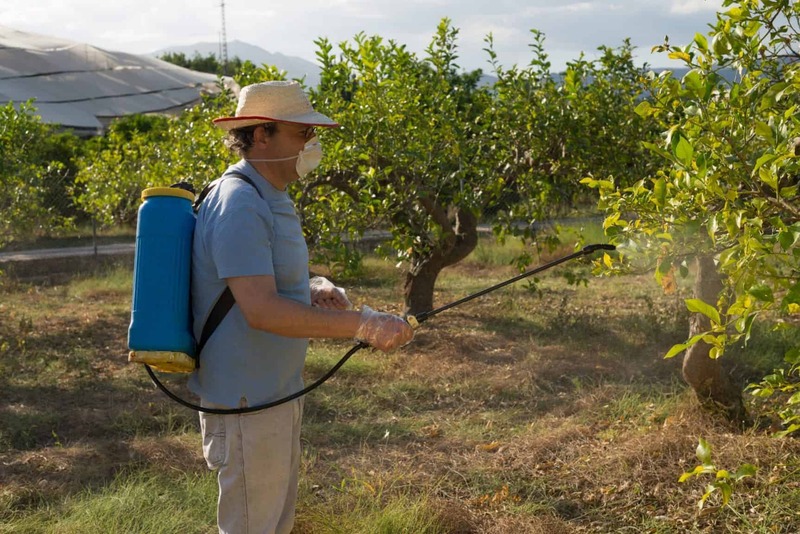 Make sure you use caution when dumping out your pesticide sprays. Don’t let it puddle on the ground or place them in a water source that your bees drink from. They will go to it for hydration and it will kill them. If you live close to neighbors, your bees can be eating at their house too. So be sure to let them know that you keep bees. Try to talk to them about using safe pesticides for their plants and yards. At the very least, ask them if they will give you a heads up when they spray their plants. That way you will have time to close your bees in their hive to protect them. So if you know that you are going to use pesticides please keep these few pointers tucked away in the back of your mind somewhere to keep your bees as safe as possible. Now, we’d love to hear from you! Do you know of any pesticides that are not safe that should be mentioned? Or what about a safe pesticide option? Do you have any other pointers for new beekeepers when it comes to spraying their gardens?